Move to a place with a yard. Yes, I see now that my life goals involve owning others. How not-so-subtly possessive. But alas, given that 2020 is less than a year away, I probably won’t achieve my despotic wishes by then. I’ll have to rethink my priorities. The other person who inspired me a lot last year (well, maybe for a few years now) was Mr. Money Mustache. So between Marie Kondo with her get-rid-of-your-garbage philosophy, and MMM’s stop-buying-garbage philosophy, I was torn about which I would adopt as my theme for 2019. So I’m taking them both. I’m sure I’ve recycled these two ideas in past resolutions. It’s an uphill battle for me on both fronts and they relate. Stop trading my time and space for garbage. With MMM in mind, I had originally drafted a post geared towards what I thought was going to be my 2019 project of reducing my annual food cost from 2018. This was in November before the end of the year and my data was incomplete so I waited to finish the post with all the dollars tallied. Lo, the outcome was stupid. Yes, I can lower my food costs. No I’m not as Mustachian as the man himself. But no. See food expenses in 2018 were lower than in 2017. Good enough for me. I apparently made strides without even trying. My theory is, part way through 2018 I gave up on finding decent plant-based options in the area because they were mostly just mediocre, so we ate out a lot less. I don’t see the dining scene suddenly improving this year. We’ll still try a few places every now and again, but maybe this isn’t the pie slice I need to improve. I will just have to look elsewhere to improve my clutteriffic living situation. Anyway, it’s not like my food takes up that much space. Except maybe the beans and rice – I hoard that as if the next apocalypse were upon us. I started purposefully throwing stuff away last year, but getting rid of things is an iterative process. For example, first, I got rid of the CD player/stereo. Then it was the DVD/VCR player. Then the VHS, DVDs, CDs, and Blu-Ray discs. And now I’m tossing the Blu-Ray player. We probably used it a handful of times before we just unplugged it and put it away. I think this is the last of the digital media I have, except for the Taylor Swift cds because TS. Although once I get rid of my PC, I won’t have any device to stick them in. I think by being on the lookout to throw things away, I end up bringing fewer things in. At least that’s the hope. Whenever I consider getting something I think about the throwaway. The only things I haven’t gotten a handle on are the plants. I want all the plants! I wanted to focus 2018 on flexibility. With my limbs. Stretch more. Use the foam roller more. I blame Instagram. Nothing good ever came out of social media eh? So that lasted for maaaybee a month? I mean I kinda’ sorta? Reality: I probably stretched no more or less than usual. You know how it goes with resolutions and old habits. I was hoping that my physical flexibility would manifest into my day-to-day life. That I could be more flexible physically and mentally. I’m not sure my brain flexed anymore than my limbs though so there ya go. Old habits are hard to kill. Then again, life is moment to moment so maybe just keeping the thought in mind helped in some way? I don’t know. It’s not something I measured, nor would I know how to. Or maybe not measuring and not tracking was itself a sort of flexibility. Just learning to go with the current moment rather than worrying about how I was in the previous moment. Anyway, I really enjoyed this “resolution” because it’s more flexible. How very meta. So I can’t tell how I did. There is no success or failure. It’s just a word. 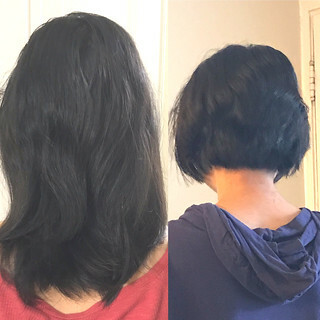 Usually, I like to show my haircuts with a before and after cut comparison. This time, I’m showing a before and after a year of growth. I’m hoping to grow it another year before lopping it off again. The thing I learned about a short cut is, I like them. They require less work to look stylish. Although I won’t go this short again because it gets all bent out of shape when I sleep and trying to fix it takes heat and effort. A bob length is easier because there’s enough weight on the hair to not get too unruly. Also, it can be tied back for the gym. I’m so glad it’s finally fall. Squashes. Coffee. And wine. That’s how I welcomed fall. Today, I stood staring at all the plants I have on my balcony wondering where I’m going to put them all indoors. You might think, just put them where they were last winter. How they went out, how they come in. Nope. It doesn’t work like that. They multiply. Or propagate or whatever. I just start propagations whenever I can as insurance. Backup plants in case the mother plant kicks the bucket. Or in case anybody wants one. Or I have an empty tomato can needing to be filled with something. I’m probably going to take a few to work. It might be the best way to ensure their survival because window real estate is tight. And also it’s mid-autumn festival. Moon cakes festival. Some moon cakes are tolerable, but for the most part, they are dense, thick, and pasty inedible things. I imagine that’s what it must taste like for kindergartners when they dig into a jar of paste. I’m so ready for fall. Sorta. I’m ready for pumpkin spice everything! But this weekend’s all day rain situation made it seem a little too right away and I’m not sure I’m that ready. I can already feel the days getting shorter and that’s a bummer. This unusually chilly, wet weekend, I looked at my closet of tank tops and just felt like tossing it all in a bag and stuffing it in the back of the closet, then curling up with a glass of wine and eating something with pumpkin in it. It’s too soon though. We still have plenty of 80 degree days to contend with. So maybe I’m not so ready for it.